Guys I.heard this is a big one John Force will be there with his funny car and signing autographs and is a great drive. Tommy, most of us are going to New Jersey for the American Muscle car show that day. whats up and hope all is well ? what was the end result of court? 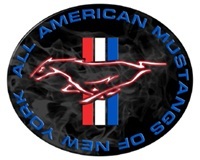 ARENT YOU GOING TO AMERICAN MUSCLE....you're the one that started that topic ? I hope you're going to american Muscle. I'm with Kevin on this now you are going to taska,I think everyone is all set for American Muscle!? ?